Planning a birthday party for an eco-conscious tot can be tricky when you consider the wastefulness and toxicity of commercially available plastic wrapped games and favors—many of which do little to encourage creativity. Thankfully, there are incredible, imaginative and sustainable alternatives for birthday party fun. 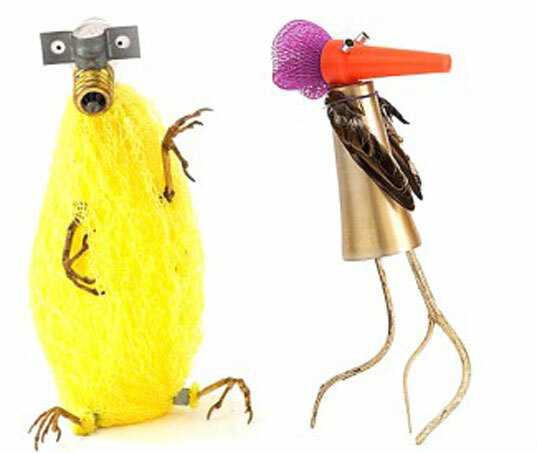 Inspired by Carolien Adriaansche, ‘Beasts of Waste’ involve a close-up visit with nature’s creatures, and a hands-on activity of beast-making from household waste. If you’re lucky enough to be in The Hague, Carolien can host an all-inclusive party for you, otherwise, follow these DIY Beast of Waste party instructions after the jump. Here’s how to pull it off. In the weeks or months before the party, start collecting odds and ends from your regular garbage and recycling. Things like empty plastic containers, fruit and veggie nets and bottle caps work nicely – the more colorful the better, and of course, keep all materials age-appropriate. The day before the party, place everything in the dishwasher and run them through without soap. Make sure you have something to use for eyes, like old buttons. If you can’t seem to collect enough at home, garage sales and thrift shops are a great resource. Plan your trip to explore nature. Carolien visited a natural history museum, which is excellent for getting up close with a variety of different animals. But you can also bring the tots to a local farm or animal sanctuary. If you take your children to the zoo for animal inspiration, support zoos which operate on high levels of integrity with regard to animal treatment, provisions and humane habitats. The Trevor Zoo is one such environment which offers this kind of unique learning experience. After you’ve taken the kids for an animal visit, bring them back home and lay out your waste spread. Provide non-toxic glues or adhesives, and let the kids create their masterpieces. Once they’ve made a collection of beasts, there are a number of activities in which to partake. Have the kids vote on things like ‘scariest’ or ‘cutest’ beast, or provide a map and let the kids decide where their beasts are from. Throw in games, snacks, and recycling lessons as you see fit. Planning a birthday party for an eco-conscious tot can be tricky when you consider the wastefulness and toxicity of commercially available plastic wrapped games and favors�many of which do little to encourage creativity. Thankfully, there are incredible, imaginative and sustainable alternatives for birthday party fun. Inspired by Carolien Adriaansche, 'Beasts of Waste' involve a close-up visit with nature's creatures, and a hands-on activity of beast-making from household waste. If you're lucky enough to be in The Hague, Carolien can host an all-inclusive party for you, otherwise, follow these DIY Beast of Waste party instructions after the jump.